I thought it was about time for me to reflect on my home schooling years. Since I can now 'talk' from both sides of the fence! I'm not for or against homeschooling or schooling. I have no conviction either way. I have seen both options done badly. Instead I believe in learning academics (to the needs of the child obviously) and parental involvement regardless of what method you choose! Whether you choose to take the teaching responsibility upon yourself or whether you 'contract' teaching out to a Christian School you SHOULD be involved in ALL areas of your child's education. Your chosen method of teaching is NOT a guaranteed way of salvation either way. My personal preference is Christian Schooling. I've got lots to say on the subject, I'm sure that surprises you (NOT). I thought that I would start with some positive things about homeschooling and some of the things that I have learned. I had never really looked into the fact that there are different teaching methods i.e. Classical, Charlotte Mason etc. My (our) main reason for choosing Sonlight was that it was a complete curriculum with high academic standards and extremely organised. Sonlight has not let me down in those areas. It has a more expensive start up cost than a lot of other curriculum. Once you have a few cores (years) then the cost would reduce significantly. I have bought two cores each year, the older two do one core and the younger two do one core with their own Language Arts (reading, writing, oral, spelling and grammar) and maths program. I've been VERY impressed by the comprehensive coverage of Sonlight's core subjects, history and language arts. For those of you who don't know much about Sonlight versus other curriculum, Sonlight focuses on learning through books as opposed to learning straight facts. I can see a lot of resemblance between what Albert is doing at Seminary and what the girls are doing. In a nutshell, Albert listens to lectures, reads books and then writes papers on what he has heard (lectures) and read (books). The girl's history in particular (and science also to a lesser extend) is almost solely book based. The girls read books around the subject from various viewpoints and then get asked questions on what they have read. Quite often in their written component of Language Arts they will be asked to 'tease out' what they have learnt. The older girls in particular, although Kate is learning some basics as well, get guided step by step on how to find the information in the book, think outside the square and then write a report on it. Since Sonlight requires HUGE amounts of reading including reading aloud by the parent (although I only do the younger girls read aloud) this curriculum wouldn't be for you if your child struggles to read. I LOVE Sonlight's emphasis on Missions. We have read some excellent books on missionaries. 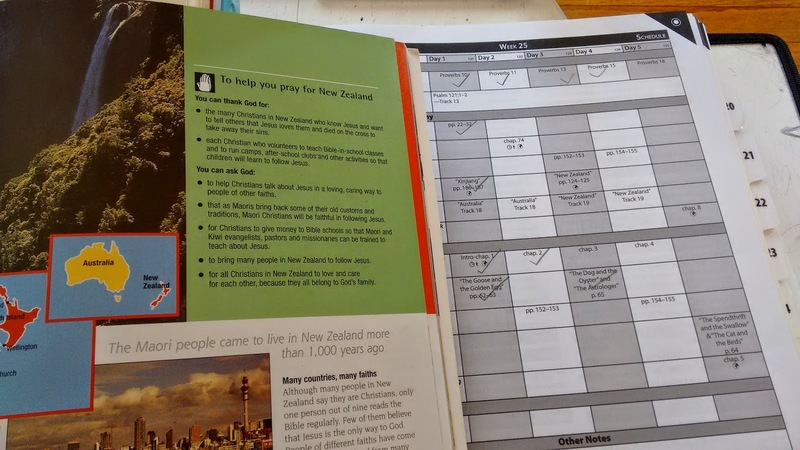 Almost daily in the schedule we are encouraged to pray for specific countries. It has broadened my worldview and I've been awed by God's work through so many of HIS people! The assigned bible reading every day is also a HUGE plus, again forced structure for me has been great! The assigned CD with their memory verse in song is also a great asset. The girls know sooo many songs which are pure scripture that when ever we get to a passage they they have learned through a song, they know the words and where it came from immediately. Sonlight's science curriculum uses mainly Usborne (secular) science books which is fascinating since there are great science home school books out there from a Christian perspective. Sonlight's main argument for this is that they want the child to be able to reason and defend their Christianity from a young age. I like it. It would not however be a deal breaker for me as whether or not to buy the curriculum. While the older girls in particular LOVE English and History, Maths is not quite as popular in our house. I've put a reward system in place in order for them to do their Maths everyday. The treats that they get everyday for doing a set number of homeschooling requirements has been VERY effective. They have to do Maths, devotions, typing instructor, a free online math program and spelling. We use Teaching Textbooks for Match which is a computer based program, it is self taught. One of the downsides of this curriculum is that if your child is a Maths whiz, it will be too easy, so PERFECT for my older girls! :). Kate loves Maths and since she has older sisters and I have all the 'next' CD's, she is racing through her curriculum! I have really enjoyed the read alouds, we have read some great books, well written, well constructed and just plain great stories. I LOVE the true stories in particular but also some of the English classics that I have never read. I have enjoyed learning about history, first American History and we are now finishing World History with the little girls. Ok those were most of the positives and instead of giving a huge list of all the negatives (which really is not very up building and loving) I thought I would negate some myths that I have heard said about both the homeschooling aspect and the schooling aspect. It makes you a better parent. This is one of my favorites, REALLY? I think I have been more angry/frustrated and apologized more than when my girls went to school. Maybe it's just me. Anyone can do it! A close second to number 1. I am sorry to say but this is a real myth. English is my second language and I really struggle with the technical English Language. (Albert corrects my blog posts) The older girls curriculum requires them to do HUGE amounts of writing, grammar and reports that are beyond my ability. Albert took over this area for me until a couple of weeks ago when one of the seminary student's wife who is a gifted teacher took over that responsibility! The main problem is that is no answer guide, whereas Maths even if you don't understand it or are not good at it, there is an answer key! I could NEVER home school. Oh really? How about for $US20,000 a year? This is one of our major reasons for homeschooling in the USA as Christian schooling is VERY expensive. What about socialization? Well if this is important to you, again there are ways and means. I don't think my girls suffer from being anti social. In fact over the summer in Wellandport, I introduced our family to many many people. I had people say, oh I've already met Zara. Unbeknownst to us she had been shaking hands with people on her own behalf! LOL! Peer Pressure. Well I sympathize BUT I have seen the positive peer pressure of school, the competitiveness of peers being extremely positive. Let's face it unless your children live in a cocoon there are going to be bad influences (I'm sure my girls are sometimes). How you deal with those is more important. I do not however believe in sending my girls into a low decile school as missionaries. Let's use this opportunity of positive peer pressure to teach our children to love EVERYONE regardless of background, believes or abilities. They don't learn as much. Well yes and no. I'm sure that I can do all the school work with even the older girls in a shorter period of time than they would if they spent all day at school. BUT the life skills that they learn at school are second to none! Simple things like obeying authority (other than Mum or Dad), waiting in line, helping/looking out for peers (sorry siblings don't count) and competitiveness are real benefits of school. I'm NOT saying you can't achieve that while you home school but it's not as simple. 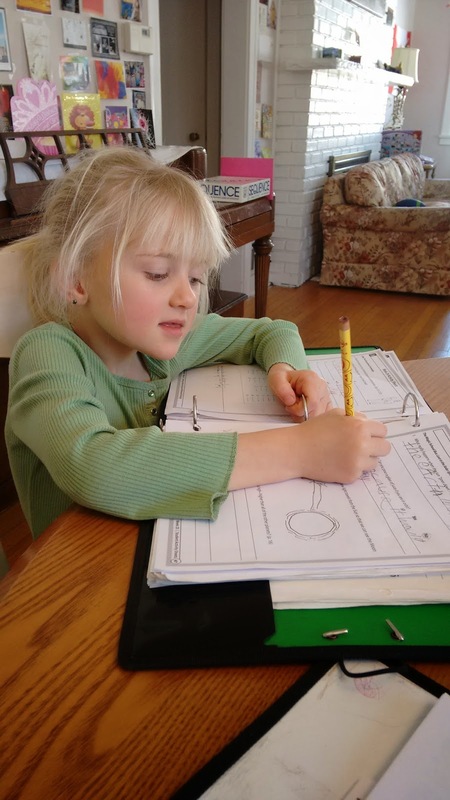 A couple of last thoughts on homeschooling. I do really miss the social aspect of school. My commitment/calling at this stage in life is schooling the girls at home (or at least supervising to make sure they do their work) and so my social life takes a backseat. Swimming has been great and I've enjoyed very much attending the ladies bible study at night. Our weekly home school meeting has been a blessing also. Either option is not a PERFECT solution, I fully understand that and I have seen both options both done badly but also VERY well. It's not about the option (although I have plenty to say about it.) It is about loving and accepting the options that we all make as parents with lots of research, advice and prayer. We do WANT the best for our children where they are at. We want to get to the heart of the child!